Having dropped out of a fiction-writing program to attend medical school 30 years ago, Jim Bailey has returned to storytelling. His first novel, The End of Healing, combines Jim’s life-long love for literature, history, and ethics with his extensive knowledge of the healthcare system and his personal experience with patients and physicians within it. Jim is professor of medicine and preventive medicine at the University of Tennessee Health Science Center in Memphis, and his academic research appears in many peer-reviewed medical journals. In his free time he enjoys running, backpacking, and taking long walks with his wife and their dog, a Brittany named Patches. Find out more about The End of Healing on Amazon. After studying the great books at St. John’s College I dreamed of writing the next great American novel, so I enrolled in a graduate writing program. My fiction-writing teacher told me I needed to write about what I knew but I didn’t seem know much of anything at that point, and medical school seemed like an easier option. 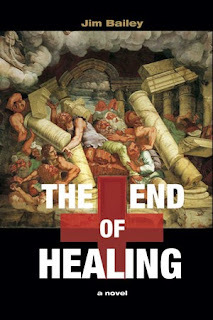 Twenty years later I started writing The End of Healing as a work of narrative non-fiction. When my spouse, who is also my editor, told me I was writing fiction—and suggested I’d better stop because it would take me forever—my first reaction was denial. 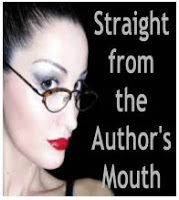 I assured her that I was, in fact, writing creative non-fiction. As usual, though, she was right. A full year later, in 2004, I realized that I was writing fiction—and that filled me with terror. I couldn’t write fiction. That had already been determined. But despite my despair, The End of Healing was a compulsion for me, and I wrote nearly every day from 2004 until its publication. I wrote and wrote and edited and edited and learned the art of story telling over the last ten years because I had to do so. The story needed to be told. And it is a story you need to hear. through my young protagonist’s eyes so that they can identify the potential pitfalls of modern medicine, ask the right questions, and be effective advocates for themselves and their loved ones. I love fascinating and empowering my readers. I hope The End of Healing arms my readers with the understanding they need to pass safely through the maze of modern medicine, take charge of their own health, demand the health care they deserve, and help remake our broken healthcare system. Indie press. It took ten years to write The End of Healing. I published through The Healthy City, a small business I started several years ago to provide health education, study tours in Italy, and consulting. By the time I found an interested publisher we were ready to publish through The Healthy City using print-on-demand. One interested publisher told me that if they published the book, it would take at least two more years to get it to print. We had done our homework, were already prepared to publish, and the book was timely. We decided to go for it. My wife is my editor, so this has been a labor of love for her as well. It was not easy on her and the kids that I work so much (It’s not just the book – I still have a very demanding day job) but they were very supportive. I couldn’t have done it otherwise. Do your pets actually get their food on time or do they have to wait until you type just one more word? What do you mean by on time? Patches, our Brittany, pretty much always gets his dinner on time. He insists on that. But I have to admit that there have been some days where he has missed his walk. On those days he always looks at me sadly and jumps up in anticipation anytime I say any word beginning with “Wa”. Like “What do you want for supper?” That one drives him especially crazy. My father propagated orchids, so I have a beautiful collection in a sunny window at my office. Some are named after members of our family so I’m generally very diligent about caring for them. But going on book tours this spring almost was the end of two of them. Thank goodness, with some watering and tender loving care they came back to life. I’m pretty good at juggling a lot of things. I found that getting up very early in the morning was the best way to have uninterrupted time to focus on my writing. There is another author by the name of Jim Bailey who flew fighter jets in WWII. Our biographies have become intertwined online and that has been difficult to correct because uploaded information tends to spread to other sites but corrections don’t follow. It reminds me of a story in my book about a man who had the left leg amputated instead of the right one because of an incorrect computer entry that was distributed throughout the hospital. Facebook, LinkedIn, and Twitter have been helpful. 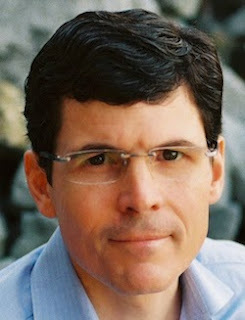 I have two websites: EndofHealing.com for the book, and TheHealthyCity.org. That’s more than I have time to manage! Of course I love to sell my book – who wouldn’t? I started with a grass-roots approach, reaching out to my own personal network of family and friends and professional contacts and asking them to help me spread the word. That’s been very effective so far. I’ve done a lot of book signings and talks at universities, churches, business groups, bookstores, and book clubs. I’m very encouraged that sales have continued to increase each month. With a national paperback release scheduled for May 5, I anticipate sales will pick up even more. We all know how tragic 9-11 was, but healthcare as we know it is far worse. People look to hospitals as great temples of hope and healing, when in fact they are the most dangerous places of all. A 747 planeload’s worth of people is killed by medical mistakes every day and we’ve done very little to stop it! To the contrary, many profit from it. People are more aware now, but when I started writing my book the public was oblivious of this danger. As a physician and healthcare researcher I could write dozens of journal articles every year in the best medical journals and it wouldn’t open the minds and hearts of the American people to understand where true healing comes from. That’s why I felt compelled to tell this story, and now that it’s published I want to jump on the rooftop and tell the world to read it! I was able to write The End of Healing because it grew out of my own experience and was a story I felt compelled to tell. Whether you are writing a PhD dissertation or a poem, great writing begins with careful choice of your subject. Now that it’s published, I have many wonderful opportunities to go out and speak to groups and share my story with others. I love doing that. I wouldn’t have it any other way. Having an important story to tell is a great privilege and this is a story that matters. I will always be thankful to have had this chance to share the story of The End of Healing.